As a conscientious business, we have chosen to group together with other retailers in joining the ‘Distributor Take Back Scheme’. Through this scheme, we have paid toward the provision of improved recycling facilities for our customers. As an American Golf customer you will be able to take any old electrical equipment to participating ‘Household Waste Recycling Centres’ run by the local council. Please remember that this equipment will be further handled during the recycling process, so please be sure to remove any non-electrical products prior to leaving your goods for recycling. Under the UK regulations, funding collected through the ‘Distributor Take Back Scheme’ has been distributed between all Local Authorities in the UK to ensure the provision of improved recycling facilities. 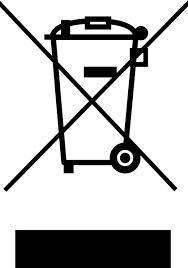 To remind you of the availability of these facilities and the importance of recycling, all new electrical equipment is now marked with a crossed out wheel bin symbol. You can locate your closest participating ‘Household Waste Recycling Centres’ at www.recycle-more.co.uk or by calling 08450 682 572. Please remember to have your postcode to hand.